I posted earlier on how you can use the LoopAlien with a tarp and a continuous ridge line, but a lot of folks prefer using guy lines just on the ends of the tarp’s ridge line. The LoopAlien works just as well with end-only ridge tie-outs and can be easily added to existing lines without untying or modifying your guy lines. 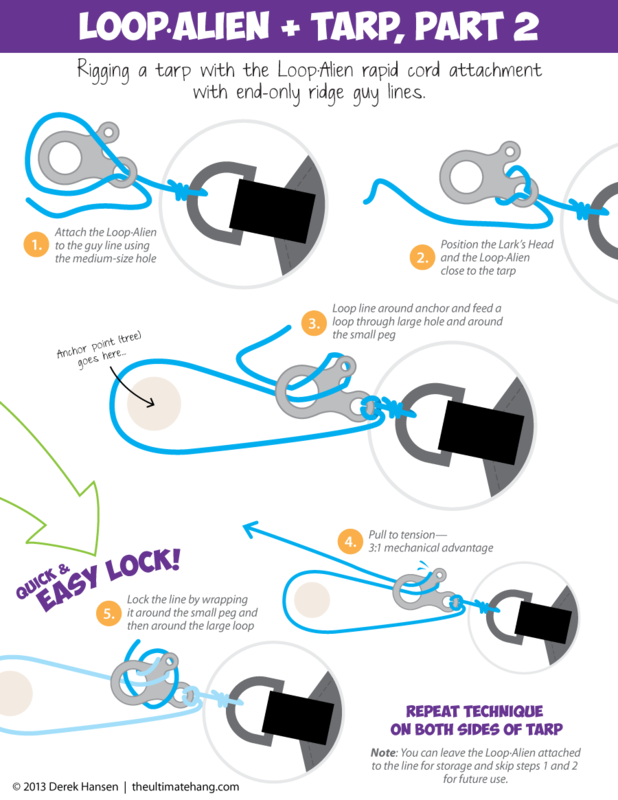 In this video and illustration, I also show an alternate method for locking the line around a LoopAlien that is easier and faster. Enjoy! Using the LoopAlien with guy lines on the ends of the tarp ridge line. While we pull to tension with 3:1 mechanical advantage, are we just killing the tree with 3:1 mechanical advantage? Any suggestions to protect the tree? Tree hugger? First, you don’t need that much torque to get a tarp tensioned. I would say that if you’re cranking down on a tarp line to the point where you’re digging into the bark, you’re pulling too hard. The mechanical advantage makes it easier and faster to tighten the ridge line, but it shouldn’t be used to ratchet down the line. Also, much depends on the tree. Trees with soft bark can benefit from a barrier to keep the line from biting into it, such as a webbing strap. As you plan ahead and prepare your trip, consider what equipment you’ll need to take to minimize your impact, just as you would with a hammock. Webbing straps with a tarp ridge line is possible, but not as easy to rig, although I do have an illustration that may help. Another method that I’ve used is focused more on preventing friction as the rope slides around the tree. Cut a short section of 550 cord, maybe 1 or 2 ft (30-60 cm) and take out the strands in the middle. Thread your ridge line through the tube and place the tube around the bark. The hollow 550 cord creates a barrier between the line and the tree and is a quick and easy method for adding a layer of protection for the bark. One final note: “girthing” a tree should be avoided. Wrapping a line completely around a tree and putting a lot of force on it can choke the tree and potentially kill it. Another reason I prefer the “V” method as it prevents this type of strangling. Like in the use of a Slackline you can place a simple barrier between the line and the tree bark. I tend to use a small piece of cardboard where ever the line meets the bark or tree tissue. Fairly light and easy to manage. It appears to me that this accomplishes a 2:1 advantage, not a 3:1. I made a free body diagram, trying to understand, but the force applied on the pull line side exerts twice the force on the load, strictly speaking, in an ideal system. What is nice about this setup is the line around the small loop greatly increases the static friction, so at rest, the amount of force needed to be applied to the pull side (free side) of the system is significantly less than the amount of force applied by the load. But, when the line is pulled (acceleration does not equal zero), a greater force in the opposite direction needs to be applied to overcome the static friction that was just an advantage in a static system. This also assumes that the mounting point (tree, whatever) can act like a pulley (generally frictionless). In actuality, that adds to the friction of the system, as the rope cannot slide freely across the surface. I haven’t checked the diagram you made for part one, but I’m assuming that because it uses 2 LAs and 2 trees, you are likely able to accomplish a 3:1 advantage. I’d have to analyze it to be sure, because technically there are 2 pulleys and no actual load, (because we would figure the trees to be mount points, and the tarp is just hanging on the system, affecting the tension but not the advantage). Is that making sense? I don’t know how you came to the solution you did, and it’s quite possible that I’m overlooking something. If I’m wrong, I would love to know. I’ve been trying for a few days to figure out how you get 3:1, and finally broke down and just diagramed it all out. You know what, I just got it. LOL. I’ve been looking at this for days, and as soon as I make a comment, it all falls into place. Nice work. This is indeed a 3:1 advantage. Thanks Ricky! I’m always open to learn new things so keep questioning and we all benefit. I really appreciate that; I’m pulling the trigger today and getting some of these. I’ve been looking for a couple of weeks and reading everything I can find on them. Your diagrams are some of the best at showing how you’ve used the LA, and you’ve used them in some very well thought out and advantageous ways! Very impressive! Do you think 1/8th inch Amsteel would be to thick to use with a LoopAlien? I don’t think so. The largest I’ve used is 7/64″ and it was tight. What are you planning to use the LoopAlien with? That diameter Amsteel is pretty serious stuff 🙂 I’ve used the titanium UFA version on a hammock suspension with 7/64, but that was just to test, and honestly isn’t a great idea because how it cuts into the line. I had to replace my suspension after I attempted it. The LoopAlien held up fine, but the turns are so abrupt that it is wearing on the line. I was going to use it for a tarp ridge line. The 1/8th is the smallest that my local marine / boat shop carries. I’ll order some smaller stuff online. Thanks for the reply! Do they have any Zing-it or Lash-it? Look for the 1.75mm or 2mm thickness. That is ideal for the LoopAlien. Before you buy the 1/8 (maybe too late), I’d just use some braided mason line from your local hardware store. Works great! That’s what I use for all my tarp tie-outs, and ridge lines in a pinch.